The annual 100,000 Tsog Offering Puja for the Protector Deity Achi Chökyi Drölma at Ayang Rinpoche’s monastery in Bylakuppe began on May 8 and will last for one week. Those who would like to make an auspicious connection with the Protector Deity Achi and the Tsok Offering Puja may send their donations to the Drikung Charitable Society account. For a tax deductible donation in the U.S., please send your check to the Amitabha Foundation, P.O. Box 2572, Aptos, California 95001, or donate online below. You may send names for dedication to info@amitabhafoundation.us until May 12 at 5 PM Pacific time. Donations are welcome at anytime. Achi Chokyi Drolma is an emanation of Vajra Yogini and Tara. She was born in the central area of Tibet. Beginning at a young age she was very special. She had great compassion and always practiced Tara, and she taught the Tara prayer for everyone in the village. When she grew older she prophesized that in the future there would be a new Buddhadharma lineage, and that she would be that lineage’s Dharma protector, whereupon she wrote protector offering prayers. 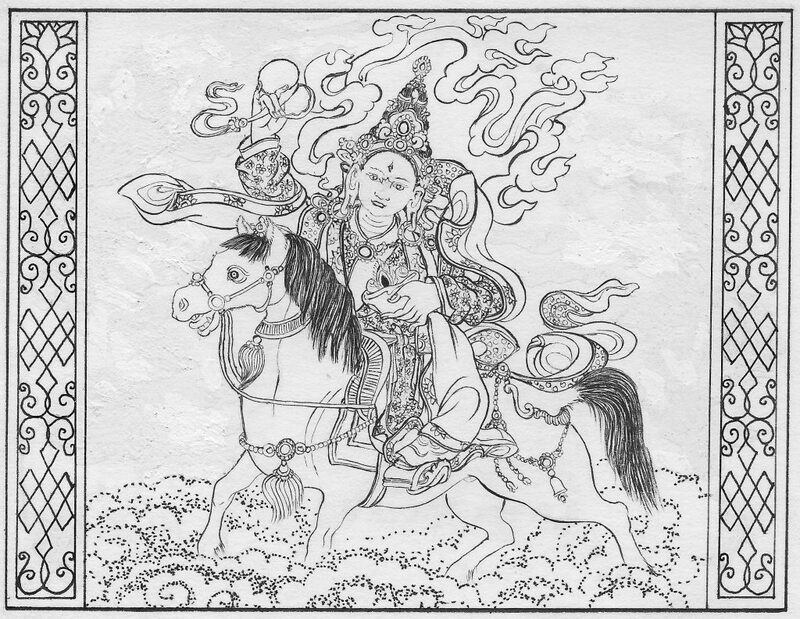 Several generations later, her great grandson Jigten Sumgon started the Drikung lineage and she did become the main lineage Dharma protector. She moved to Eastern Tibet, married and had 4 sons. Her most holy practice place is in East Tibet. At her death she attained the Great Rainbow Body. Her entire body become rainbows and light, leaving only her hair and nails. Like this, with no need to change this physical body, she went to the Pure Land. On the relative level Achi was like the Dharma protector. But on the ultimate level, Achi had already attained the 10th Bhumi of a Bodhisattva. In this way, Achi was already enlightened. Achi’s activity in Tibet is very famous. All the Tibetan people, especially the older generation people, know very well about her great activity, how it is so helpful because it is very fast. In Tibet, some great masters say that Achi is exactly the same as the Buddha, and if we pray to Achi, then by our Achi practice we will achieve enlightenment, or we will attain the Pure Land at our death moment.